2) Do not bake the cake more than 35 minutes.Keep an eye from 30 minutes It easily gets very crumbly even if it is slightly over baked for a minute. 3) As mentioned earlier this cake should be served with a sweet topping. 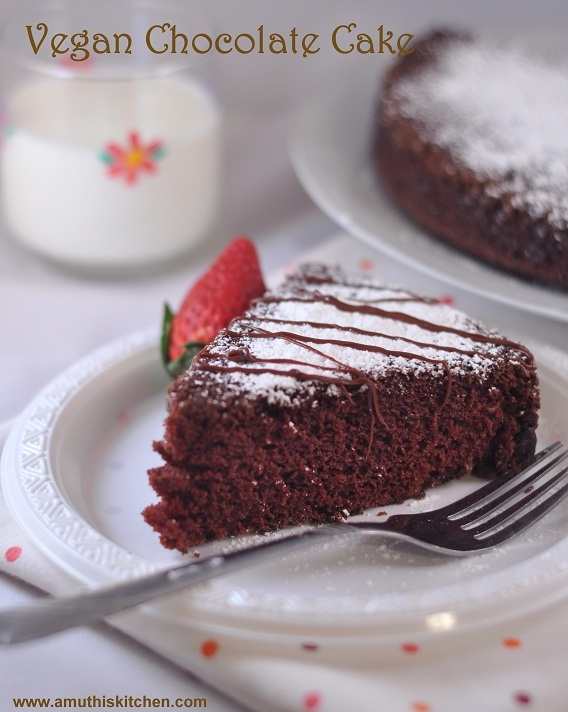 so soft and delicious chocolate cake. Looks too good Shylaja...Nice click too.. I too love this recipe very much as this can be put together in just minutes..Yummy cake!! Wat a beautiful cake, definitely vinegar works out wonder for eggless and vegan bakes with baking soda. The cake is very airy and soft.Perfect chocolate cake. Cake looks yummy and moist.Very nice clicks, looks tempting! Perfect vegan version of chocolate cake... Love the presentation..
My Mum always made this cake when I was in school - now I make it whenever we fancy a treat!! Cakes without egg doesn't make any sense to me. But this one here looks so scrumptious and tempting that i wish i could transfer it online. Thanks for sharing the recipe. I need to try it without egg. I too prefer eggless cakes. I will try to bake it in my kitchen after reading your tips. nice recipe .it looks amazing and i cant wait to eat this delicious cake.